The United People's Freedom Alliance (UPFA) has embarked on an elaborate programme to erase the remaining scars of the separatist war that ended last year and give Sri Lanka a 'new face'. Gone are most of the Military and Police checkpoints in the City of Colombo, an eyesore that belied normalcy. Those in the outer city and principal towns face closure in the coming days. Most troops who held assault rifles to ward off threats to national security will now engage in development projects. Police in principal towns, including the capital Colombo, have already embarked on beautification programmes. They are summoning residents in their police areas and asking them to keep the streets and drains clean and to prune branches and put flower beds outside their homes; they are helping to bring down unauthorised structures whilst other state agencies are widening roads and building pavements. Troops and Police are also joining health authorities countrywide in the campaign against the spread of dengue. With just over two weeks for the swearing in of President Mahinda Rajapaksa, for a second term, the tempo is increasing. When the weeklong celebrations to mark the event begin on November 15, a programme to plant 1.1 million trees countrywide within just eleven minutes will get under way. Titled Peyata Sevana, this programme will be carried out in all districts beginning at the auspicious time of 10.07 a.m.
Colombo's Independence Square will come alive. At the historic Independence Hall, religious ceremonies will take place for three days beginning November 17. A ministerial team headed by former Prime Minister, Ratnasiri Wickremenayake, decided this week to request G 15 member countries to send representatives for the swearing in ceremony. The G15, is a group of 17 developing countries from Asia, Africa and Latin America, set up to foster cooperation and provide input for other international groups. Such groups include the World Trade Organization (WTO) and the Group of Seven rich industrialized nations. Also being invited are representatives from the South Asian Association for Regional Co-operation (SAARC) and the Commonwealth. The Ministerial team has decided that during the morning of November 19, schools countrywide will hold a special assembly before classes begin. That will include a briefing to the students on the significance of the swearing-in and religious ceremonies. Rajapaksa will take his oaths at an auspicious hour past 10 a.m. on that day. About 5,000 invitees are expected to watch the event in the areas outside the Presidential Secretariat, the former Parliament building. At that moment, a ship will leave from the Galle harbour to the Hambantota (Magampura) port with members of the Buddhist clergy chanting Sagara Pirith. Grama Sevakas (village level government officials) have also been told to organise public functions in their areas. UNP Deputy leader Karu Jayasuriya having lunch with party members and people of Horana as the first stage of the Grama Charika programme yesterday. Pic. by J Weerasekara. Rajapakasa left for China on Friday. He will attend the Shanghai trade fair and fly to Beijing for a meeting with Prime Minister, Wen Jiabao. His visit also co-incides with another important event, the China Overseas Investment Fair that begins in Beijing on November 2 and ends the next day. It is being held at the China World Trade Centre. The main objective of this fair is to increase investment between China and foreign countries and to invest money in the least developed countries. This fair is seen as a platform for Chinese companies to enhance their investment and to make a path for their success. UPFA sources said Rajapaksa would also hold talks with the Chinese Premier amidst reports that further Chinese financial aid is on the cards. That it comes ahead of the budget Rajapaksa will present in Parliament on November 23 has added significance. The same sources said there would be a relief package to the poorer sections of society and a pay increase for public sector workers. Ahead of the budget, the prices of cigarettes and alcohol have already been increased by the Ministry of Finance. During his new term, Rajapaksa is expected to make a few changes in the Cabinet. Among the new faces, according to the same sources, are two former UNPers - Abdul Cader (Kandy District) and Lakshman Seneviratne (Badulla District). Other names being mentioned are Rauf Hakeem, leader of the Sri Lanka Muslim Congress (SLMC), Mahindananda Aluthgamage (Kandy Disrtrict) and Dilan Perera (Badulla District). An even more significant move in the efforts to create a 'new face' was a decision taken by the Cabinet on Wednesday night. It came seven weeks after the Lessons Learnt and Reconciliation Commission (LLRC) submitted an "interim report." In a letter dated September 13, 2010, signed by its chairman C.R. de Silva and members H.M.G.S. Palihakkara, Dr. A.R. Perera, M.P. Paranagama, Ms. Mano Ramanathan, Prof. Karu Hangawatte and M.I.M. Bafiq, they told President Mahinda Rajapaksa that in the Commission's view there are "some issues which deserve urgent attention." They said, "Immediate action on these issues, would provide relief and engender a sense of confidence among the people affected by the conflict." It would also provide an impetus to the reconciliation process envisaged in the mandate of the Commission, they added. It was External Affairs Minister, G.L. Peiris, who forwarded a Cabinet Paper for last Wednesday's meeting. It said: "The Commission on 'Lessons Learnt and Reconciliation," which was established pursuant to the Warrant dated 15th May 2010 issued by H.E. the President, commenced its public sittings from 11th August 2010 onwards. The sittings have included as well field visits to several locations in the North and in the East, including places of detention, rehabilitation and IDP welfare centres. On the basis of its work, the Commission submitted an Interim Communication on 13th September 2010 to H.E. the President. A copy of this Communication is attached. (d)	resolution of administration and language issue. (e)	encouraging socio-economic progress and facilitating livelihood efforts through improvements to the co-ordination and communication between the Agencies involved in the normalisation process, while also affording ever greater opportunities for participation in economic and other activities, through the free movement of persons on the A-9. "The recommendations contained in the Interim Communication echo the policies of the Government as well. Thus, the collection of unauthorised weaponry is an on-going process that began in the East and is now continuing in the North as well. The High Security Zones are being progressively reduced in extent and land in such areas is available to be restored to due ownership, or to be allocated for social and developmental needs. "Approximately 5,120 of the 11,696 LTTE cadres who surrendered themselves at the end of the conflict in May 2009 have already been released. Those releases come in the wake of a dedicated unit having been established in the Department of the Attorney General, with the association of the other concerned Agencies. The process of normalisation is under way and the Government is working towards ensuring the language rights of all citizens, as per the Constitution. It would accordingly be appropriate that these processes that are under way should be further strengthened, so that the recommendations in the Interim Communication from the Commission are implemented through practical measures. It may be noted in this regard that with a view to implementation, directions have already been given to the relevant Government Agencies to take appropriate measures without delay. In order to facilitate this endeavour, it is proposed that an Inter-Agency Advisory Committee consisting of the following should be established. (f)	Secretary/Presidential Task Force for Resettlement, Development and Security in the Northern Province. Publishing a list of names of those in detention. When a person is discharged a certificate be issued so that the same person is not taken into custody again, unless new evidence is discovered against him for being linked with the LTTE. To look into the general issue of laws delays (to expedite prosecution or discharge detainees). The LLRC's Interim Communication has also dealt with the law and order situation in the liberated areas. It has said, "It was brought to the attention of the Commission that despite the end of the conflict significant issues of law and order still remain. There is apprehension in the minds of people due to continuing acts of extortion, abduction and other criminal acts by armed groups. The Commission recommends that specific measures be introduced to ensure the maintenance of law and order in these areas; particularly the disarming of any illegal armed groups. The Commission regards this as a matter of high priority." Though President Rajapaksa appointed the LLRC, it is noteworthy that it is External Affairs Minister, G.L. Peiris who presented the cabinet paper to give effect to the recommendations in the 'Interim Communication'. He has been vested with the task of conveying to foreign governments the steps being taken by Sri Lanka to address post separatist war issues. This is particularly in the light of the ongoing probe by a three-member United Nations panel into so-called war crimes allegedly by troops and Tiger guerrillas during the final phases of the separatist war in May last year. In fact, even before the Cabinet decided on the matter, Prof. Peiris had briefed his British counterpart, William Hague last week on the role played by the LLRC. However, the British Foreign Secretary was to articulate his government's position that there was a "need to have a credible and independent process to address allegations of violations of international humanitarian and human rights laws during the conflict." During a meeting the same week with the Opposition Leader Ranil Wickremesinghe, Hague had added that whether the Labour or Conservative party was in power, Britain's Sri Lanka policy has not changed. The UPFA insists that there is no need for a UN panel since the LLRC has already undertaken the task. Even before it had concluded its sitting, the Commission was making interim recommendations for urgent action. Adding to British Foreign Secretary's remarks was Prime Minister, David Cameron. In the House of Commons, during the weekly Prime Minister's Question time, Ms. Siobhain McDonagh, asked him "As a former PR man would the Prime Minister agree with me that no matter how much Bell Pottinger tries to spin the Sri Lankan government, that the demands for an international, independent war crimes tribunal intensifies as more evidence of alleged assassinations and civil rights abuses come out." Premier Cameron replied, "I think the Hon. Lady makes a fair point. We do not see an independent investigation of what happened. Everyone has read the papers and seen the tv footage, but we need an independent investigation to work out whether what she suggests is right." In the light of this, External Affairs Ministry officials say, Peiris' efforts to secure a meeting for President Rajapaksa with Premier Cameron did not materialise. This has been one of the main reasons for the British visit by Peiris. President Rajapaksa is to travel to Britain in December to address the Oxford Union. High Commissioner in London Nihal Jayasinghe insisted yesterday that the President will be addressing the prestigious Oxford (Debating) Union and not any of the lesser associations at Oxford University that have booked the union hall. Fears that political groups were using university students to resort to violence and thus muddy the atmosphere during the swearing in ceremonies has prompted the Government to take a tough stance. President Rajapaksa presided over a conference of Vice Chancellors of universities to discuss the matter. It was pointed out that the Janatha Vimukthi Peramuna (JVP) backed Inter University Students Federation (IUSF) was at the root of a string of incidents. The meeting was also attended by Police Chief, Mahinda Balasuriya. Later, at a discussion with senior Police officials, Balasuriya ordered the arrest of Udul Premaratne, convenor of the IUSF. Reports with the Police said there was evidence of his involvement in allegedly instigating the students. To avoid accusations that the arrest would be perceived as a crackdown on political opponents, Police sought an order from a Magistrate. He, however, said such an order was not necessary and the Police could carry out the arrest if they had evidence that the person concerned violated the law. A second application, however, was allowed. Remanded university students being taken back to jail after they were produced in court in connection with the attack on higher education ministry officials. Pic. by Sanka Vidanagama. Whilst the Police were busy preparing for the arrest, a development of some significant proportions was taking place. The Janatha Vimukthi Peramuna (JVP), which has distanced itself from the United National Party (UNP), in its campaign to have former General Fonseka released from jail, was knocking at the UNP door through the IUSF, its student body. A delegation led by Udul Premaratne was seeking a meeting with Ranil Wickremesinghe and his party seniors. The UNP leader, who was to leave for engagements in Kandy on Friday, entrusted the task to his deputy, Karu Jayasuriya. When Jayasuriya learnt that the delegation would include student bhikkus, he made sure some of the chairs where the IUSF delegation would sit were covered with white cloth. On hand to help him when the meeting got under way, were General Secretary Tissa Attanayake and Ruwan Wijewardene heading the committee on UNP youth reforms . Jayasuriya was judicious in explaining the UNP position. He said his party unreservedly condemned the assault on the Vice Chancellor of the Ruhuna University, Professor Susirith Mendis and other alleged acts of violence by students. However, he said the UNP was willing to address the genuine grievances of the university students. The assault and other incidents of violence had embarrassed even the JVP . So much so, JVP frontliner Anura Kumara Dissanayake said his party did not endorse all what the students did but was only protesting against what he called the repressive measures of the Government. Yet, both the JVP and the UNP did not seem to realise the gravity of the situation created by student violence. Firstly, neither side thought it fit to issue statements condemning the assault on Vice Chancellor Mendis or on the forcible occupation of the Higher Education Ministry by the students. If not condemn, they could have at least called upon students to be restrained and resolve their issues through dialogue. Even worse, any attempts at escalating the violence would have only affected the public at large. It would have given sufficient justification for the Government to re-introduce military and police checkpoints and revert to stringent security measures. Udul Premaratne was arrested just as he stepped out of the UNP headquarters at Pita Kotte. Factions in the UNP were critical of Jayasuriya for entertaining the IUSF leaders inside the party headquarters and allowing them to use the premises to hold a news conference when their actions hadn't won public sympathy. The past weeks have seen a series of incidents where university students were involved. In June this year, Police arrested four students of the Peradeniya University after they reportedly jeered at S.B. Dissanayake, Minister of Higher Education, who visited the campus. Kandy High Court Judge Keerthi Padman Surasena refused to release them on bail. At the Ruhuna University, six students have been remanded for assaulting Vice Chancellor Mendis. Three have been placed in remand custody for this alleged assault whilst the university authorities have suspended six more students. At the Rajarata University Management Faculty, two student groups clashed with each other. Vice Chancellor K.N. Nandasena called in a 400 strong police unit to "ensure a peaceful atmosphere when examinations were conducted." Nineteen students who were involved in the incidents were suspended. 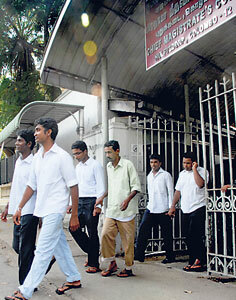 At the Kelaniya University, students defied a request by the authorities to vacate their halls of residence. The Police obtained a court order to evict them triggering off a student protest. An unidentified group severely assaulted a student leader and later whisked him away in a three-wheeler scooter. At the Sri Jayawardenapura University in Wijerama, Nugegoda, a group of student monks allegedly assaulted a Sub Warden of the hostel. He was admitted to the Colombo South Hospital in Kalubowila. The incident had occurred when the Vice Chancellor N.L.A. Karunasena made a surprise visit to the monk's hostel. In the wake of the string of incidents involving the students, a joint approach by the UNP and JVP over the issue seems highly unlikely. Yet, it is significant that the party hierarchy gave a nod to the IUSF to test the waters. The strain in relationship caused by the Fonseka issue remains a sore point. So much so, some JVP leaders vowed to take on Ranil Wickremesinghe for his remarks to the UNP's Working Committee that Democratic National Alliance (DNA) Secretary, Tiran Alles, sought government help to relax security on the day the DNA staged a mass protest. Alles, who told JVP leaders he had not done so, has since left for Britain. For the UNP, the pre-occupation this week was on its new project to win back lost grassroots level support - Grama Charika (Rural Visits). During the two day event which began in Horana yesterday, party leaders live in the homes of their supporters and discuss a wide variety of issue. It began yesterday with deputy leader, Karu Jayasuriya and others calling on the senior most UNP member in the district, Indradasa Hettiaratchchi. Later, they visited a temple. A Bala Mandala meeting and an eye clinic was also held. Today, they will have a field lunch where their leader, Wickremesinghe will also take part. Jayasuriya and other party leaders stayed in the homes of party supporters in Horana. Though he served in a Committee that formulated the modalities of the Grama Charika programme, leading dissident Sajith Premadasa (MP-Hambantota) was to criticise it. He told the Island newspaper of October 20 the programme is nothing new. "The party leadership has failed to realise that such ad hoc measures wouldn't make any difference on the ground." What we need, he said, is a genuine change in our strategy. There is absolutely no point in adopting dilatory tactics," he said. Angered by the remarks, Jayasuriya told a delegation of office-bearers of the UNP Professionals Group the Wednesday before last, that Premadasa was a member of the Committee that had agreed to Grama Charika. It had later been endorsed unanimously by the Working Committee. He said that young Premadasa's separate village-level meetings were running parallel to the Grama Charika which was officially endorsed by the party's Working Committee and would show that the party remained divided on every issue. However, at a news conference on Thursday, Jayasuriya stuck a more conciliatory note saying all were welcome for the event. He said that more UNPers going to the village was better for the party. Premadasa had his own rally in Horana on Thursday. He also visited two Gam Udawa (village re-awakening) sites built by his late father. Yet by a strange co-incidence, Premadasa also struck a conciliatory note. Like most other UNP seniors, he made the media the scapegoat. He told the Sunday Times, "The media has concocted a story that I am on a different path from the UNP. I am with the Grama Charika programme formulated by the Party to go to the villages. I am a politician who has championed this cause .On Thursday I was in Horana where I visited three model villages built during the tenure of my father. "I am more of a part of the UNP than the new comers to the party. I will be attending the meeting (Grama Charika rally at Horana) on Sunday. I have also started a programme "Sasunata aruna" on the lead up to the 2600 Sambuddha Jayanthi next year. We are giving Rs 50,000 to needy temples for their development work and two of the beneficiaries so far have been the Mau Gama Batuwita temple which is my grandmother's village and the Aruna Gama temple while on Sunday too I will be assisting two other temples in the same area namely the Palpitigoda Nandarama Viharaya and the Nimlagama Sri Madura Sama Viharaya." The momentum over the 'Release Fonseka Campaign' seems to be slowing down though both the UNP and the JVP have not given up their efforts. On Friday, the Supreme Court rejected Fonseka's petition challenging the outcome of the presidential election of January 26. The five Judge bench headed by Chief Justice Asoka de Silva and comprising Justices Shirani Bandaranayake, K.Sripavan, P.A. Ratnayake and S.I. Immam dismissed the petition. The petitioner claimed that there were several malpractices and incidents that occurred during the elections. He also said there was also thuggery and most of the Government property and vehicles were used in support of President Mahinda Rajapaksa. This was against the rules and regulations laid down by the Elections Commissioner and therefore the Election was not free and fair, he alleged. Fonseka however was left stranded after his arrest with even the JVP distancing himself from the election petition. Eventually, some steadfast UNP lawyers who came to his assistance and held on to what was going to be what one of them conceded was a "leda case" (troublesome case). They were scratching their heads contemplating the logistics of finding, keeping in safe custody and bringing to court witnesses to prove their case. Without any proper backing, the Supreme Court rejecting the case in limine, i.e. due to a technical defect in the Petitioner's case probably came as a relief even to Fonseka's own team. His remaining legal battles will however continue in the High Court, the Appeal Court and the Supreme Court while on the political front, the parties seem to march to different drums in what appears to be the somewhat waning support for the victorious former Army Commander. Amazing – a hoot goes a long way! ‘Graama charika’ or ‘pita rata charika’ – what’s Ranil’s priority?